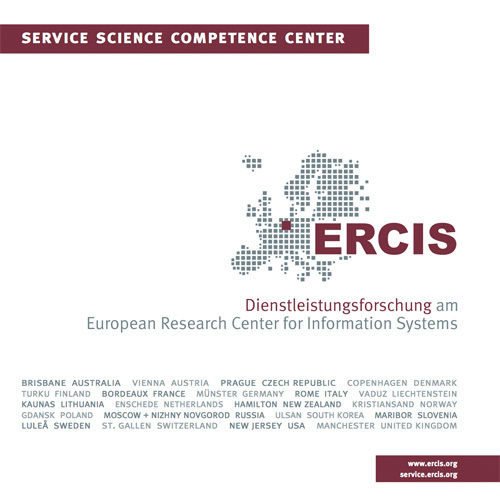 PUSH | ERCIS Competence Center "Service Science"
“Hybrid Value Creation” refers to offering custom-fit solutions consisting of physical goods and value-added services, including consulting, maintenance, recycling service or even operating the entire solution “as a service”. Manufacturer that transform into providers of customer solutions may expect several benefits – higher margins, improved differentiation from competitors and superior customer retention. In recent years, Münster grew into one of the most significant global locations for research on “hybrid value creation”. WWU Münster and the Münster University of Applied Science developed models, methods and software tools of high scientific quality and immediate utility for the practice. Against this backdrop, the goal of this project is to make the various research results achieved by the researchers in Münster applicable to the small and medium enterprises in the Münsterland region surrounding our city. The project will therefore develop frameworks to structure previous results as well as communication and educational material in order to transfer knowledge to the practitioners. We will further launch a roadshow and exercise round tables to bring together researchers and practitioners in the region. The project is supported by the European Union's "European Regional Development Fund" and the Ministry of Economic Affairs, Energy and Industry of the State Government of North Rhine-Westphalia in the context of the Regionale 2016 (promotion sign: IV A 5-43-01/2.1/Z27C). Further information in German language is available at: www.push-muensterland.de.